I was the last hold-out among my local circle of friends to hire a babysitter. I just couldn’t bear the thought of entrusting the care of my precious little ones with anyone outside of our family. And given that we have no family closer than an 8 hour drive away…well, you can just imagine how rare our date nights have been. It wasn’t until I was about a month away from my due date with our second child (as it turned out, it was just a week before he was actually born!) that the reality of two kids finally set in with me. My sanity was going to depend on having a trustworthy helper. End of story – the most wonderful woman now comes over to watch Dora the Explorer and rock the infant seat for a few hours every week while I “get things done”. She genuinely loves children (she’s got three grown ones of her own) and, best of all, she loves my children. My daughter took to her immediately which was pretty much all I needed to observe to move past my fears. If she could get comfortable with a babysitter than so could I! Did I mention that our Mary Poppins likes to bake too? When I told her about Cooking On the Side she remembered a cookbook she had at home, Philadelphia Cream Cheese Classic Recipes, and offered to lend it to me. How cool is that? I definitely had to make one of the cheesecakes – the Cookies and Cream one, complete with Oreo crust, called my name. Cheesecake tends to be over-the-top rich so I’m usually good for just one, maybe two slices tops per year. This Cookies and Cream cheesecake was definitely a good use of my annual quota. 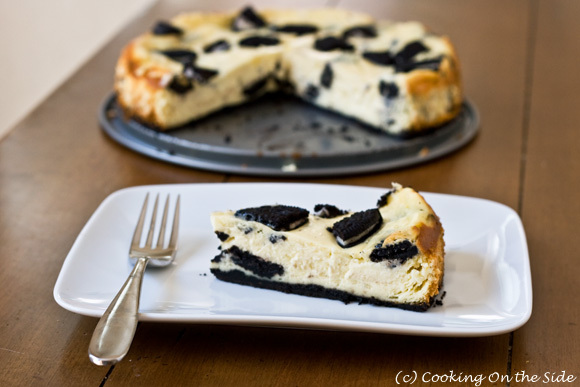 It’s pretty straightforward – your typical tangy cheesecake, studded with Oreo cookies. When I gave my daughter a taste she remarked, “Want some more…ice cream!” And she’s right, it’s very much like eating Oreo ice cream. Especially when you enjoy it cold, right out of the fridge. A babysitter who will watch endless Dora with my daughter, smile and laugh with my son and even help me with my blogging? I couldn’t have asked for better. Mix cream cheese, sugar and vanilla with electric mixer on medium speed. Add eggs; mix on low speed just until blended. Fold in 12 quartered cookies. Pour over crust. Place remaining cookies on top of batter. Bake at 325°F for 50 to 55 minutes or until center is almost set if using a silver springform pan. (Bake at 300°F if using a dark pan.) Run knife around rim of pan to loosen cake; cool before removing rim of pan. Refrigerate 4 hours or overnight. .-= dawn´s last blog ..banana cheesecake w/ caramel-rum sauce =-. 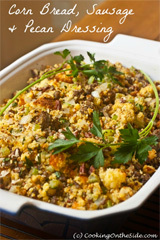 .-= Pennies on a Platter´s last blog ..BBQ Beef Casserole =-. I love Cookies and Cream Cheesecake!! Yours look fabulous!!! I wish I could make this now. .-= Memoria´s last blog ..Chocolate Chip Cookie Dough Ice Cream =-. My favorite ice cream flavor turned into a luscious cheesecake. It doesn’t get any better than that. YUM! I used to make this cheesecake years ago. It kinda became my signature dish for a few years. Yours looks absolutely fabulous! Thanks for reminding me of an old favorite!!! .-= Kathleen´s last blog ..ChocolateTruffle Cookies =-. .-= Emi´s last blog ..Sablés Cerises-Amandes =-. Your English is perfect – thanks for stopping by, Emi! YUM! 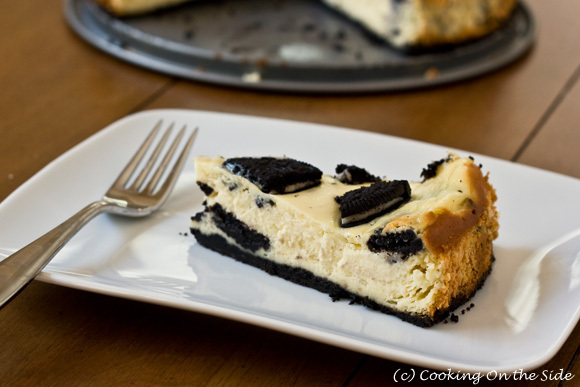 This is a combination of two of my favorite sweets-oreos and cheesecake! 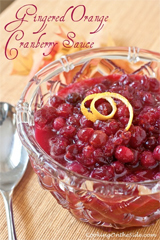 I can’t wait to try out this recipe! .-= dani´s last blog ..#72) Lovely Lemon Squares =-. This combination though i never thought about it looks like a winner. .-= s-picnic-ideas´s last blog ..Healthy Picnic Food Ideas: Allergen-Free Suggestions =-. 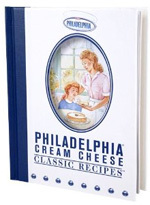 I have the Philadelphia cookbook as well! I made the Caramel Brownie Cheesecake recipe this past weekend, and will be posting it on my site soon. 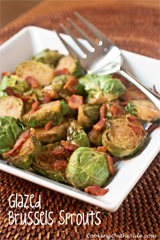 It was really good, so I can imagine this recipe is great as well! Caramel Brownie Cheesecake sounds *amazing*! This looks great can’t wait to try! I would totally make this if Oreos were cheaper!